“Travis the Warrior” Day at Clarkesville Academy 4/18/2013 | Travis the Warrior --- Kickin' Cancer! On this day, April 18th, 2013, I hereby make every Thursday until school is out, “Travis the Warrior” day. We will wear green shirts to work at the Cougar Café. Also, Travis will receive the Cougar Café spatula. You are truly what we call in the cooking world, one tough cookie. We love you baby! Thanks so much to Coach (aka the Barber), Tammi, Stan, Aunt Karen, Uncle Clint, and Jeff. 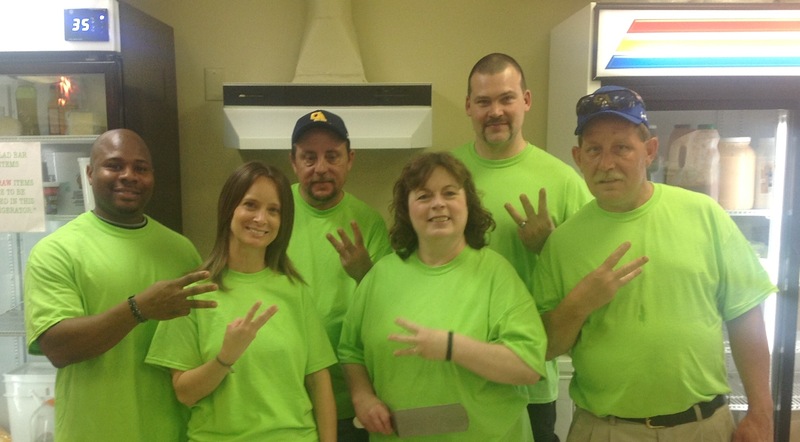 You all look great in green (Travis’ favorite color) and thanks for flashing the “W” (for Warrior) sign for Travis! Go Cougars!